Burnishing adapter allows you to use very light pressure by allowing the cutter to glide over the engraving surface, without cutting too deep. It is usually used while engraving coated soft metal, resulting a removal of the top layer and exposing the coated metal. 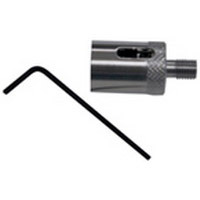 The adapter allows the" float" of the cutter to ensure even contact over the entire engraving surface.